The Death of Captain Marvel review – AiPT! One of the few times a death of a hero meant something, and still holds all these years later. This graphic novel is one I admit I had some prejudgments of before I even turned a page. For starters, it’s a four story reprint compilation of a comic starting in the late ’60s for a character who had been cancelled because he just wasn’t popular. You know how campy and in-your-face old comic book dialogue can be, as well as the Silver Age of comic art that is classic, but today looks dated. To top it off, this is a “Death of” book, which comic fans have been so desensitized to over the past decade (just last summer we saw half of the Marvel Universe disintegrate into dust). As the old adage goes though, “don’t judge a book by its cover”. Actually, the cover is pretty sweet, but the phrase still stands. However, the final moments of Mar-Vell make The Death of Captain Marvel a must read for any and all comic book fans. Let’s get one thing out of the way: The Captain Marvel movie is right around the corner, but no, in no way is this related. The characters do share somewhat of a history due to Marvel’s desire to retain the copyright for the character name, but knowing the history of Mar-Vell (as he is known) will in no way be required reading. The current Captain Marvel, Carol Danvers, is more of a successor than a reimagining of the original. One thing is for sure, the average movie goer has no idea who Captain Marvel is, so I’ll be curious to see if this drums up any interest to the lineage of the character. Like I said in my opening, Captain Mar-Vell spans between the Silver and Bronze age of comic books. The first story arc that takes place, his introduction, is clearly from the former. A Kree, he is sent to Earth on a secret mission and comes face to face with a Sentry. Nothing too exciting about this adventure but it does set the stage for the character. Interestingly his costume is far different than what we’re accustomed to and his powers are all but non existent aside from the aid of Kree technology. We do get a little bit of explanation of the transition from old to new Captain Marvel, but what is oddly absent is the story arc where this takes place. Not many are going to know the history of this character, so having that context would have been nice. It by no means negatively impacts what this book is about though. It is odd going from the green and white clad space James Bond to the cosmic Superman knockoff who leaves a trail of sparkles as he flies. Flipping through the pages, you can instantly tell where the Silver Age arc ends and the Bronze Age picks up. The next story involves Nitro, a man who can explode at will, hijacking a shipment of “compound thirteen” which is essentially a toxic nerve gas. While not a nail biting tale, this story comes full circle later on. The book continues with a trip to Titan, the home planet of Thanos. My best guess for the inclusion of this is to establish the location of Titan, but more importantly, to show the kind of person Captain Marvel is. Despite being a target of Drax the Destroyer (boy, he’s come a long way), Mar-Vell risks his life to save him. After reading the opening arcs, I can see why Captain Marvel originally got the can. It couldn’t have been easy to compete with the likes of Batman, Superman and a slew of Marvel heroes. However, once I started in on the “Death of Captain Marvel” story, it occurred to me this is probably one of the best and emotionally heartbreaking death storylines ever done. Up until this point, the only big loss for the comic world was Marvel Girl’s transformation into Phoenix. The death of Captain Mar-Vell could arguably have been the catalyst for the realization that as much as we love to see our heroes succeed, watching them die can be a draw of its own. The death of Superman had an exciting build and was a boon for the industry but that was intended to sell more comics, where Mar-Vell’s death comes off as a farewell to the character with genuine sadness. What separates his passing from almost all other heroes is that he isn’t defeated on the battlefield, but succumbs to cancer. Creatively, the compound thirteen from one of his earliest appearances is what was used as the catalyst for his specific type of disease. We watch as he comes to terms with his inevitability and the wave of emotions those around him go through. All of the greatest minds in the universe do what they can, but realize their actions have come too late. Most importantly, the way the events of Mar-Vell’s final moments play out is something a lot of people can relate to. What’s touching is how all of the Marvel heroes, and even some of his greatest enemies, come to Titan to pay their respects to Mar-Vell and say their last goodbyes. This isn’t meant to be a moment of shock that surprised us all, but the building to a painful loss of a loved one we must accept. 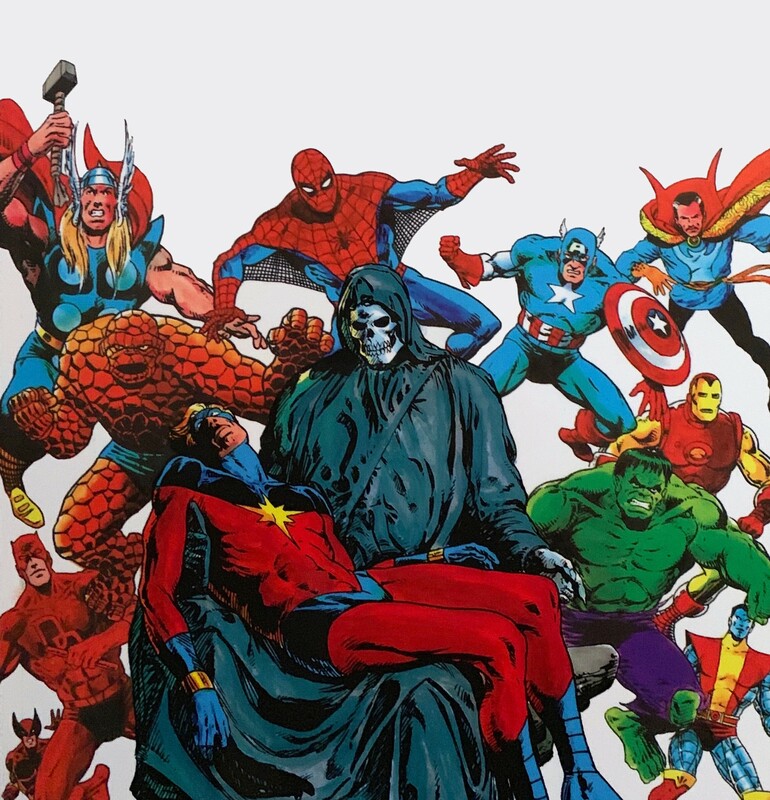 What particularly strikes me is that Mar-Vell has mostly stayed dead. Whenever he is seemingly brought back, it turns out he’s a clone or Skrull in disguise. On the rare occasion he is actually resurrected, the story plays out in a way that he remains at rest. So often the weight of a character’s death is nullified by the fact they make a glorious return six months down the line. It could be for the best though — the original Captain Marvel was cancelled for a reason. This could also be because Marvel has moved on to another hero dawning the costume and name of the same character, but regardless, it helps preserve the importance of this moment in comic book history. I can’t say reading through this gave me any urge to go back and read more of Mar-Vell’s adventures, but this is for sure a story every comic fan should read at some point in their life. One of the few times a death of a hero meant something, and still holds up all these years later.